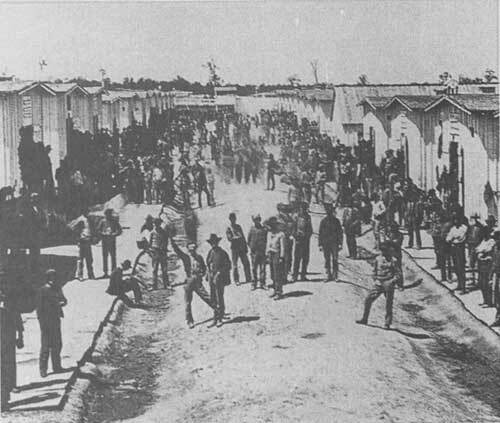 The problems with obtaining lumber even affected sanitation at the prison camp. Captain Wirz came up with a very good idea for the problem of the sewage and the "sinks," toilets in modern terms. He planned to build two dams across the stream running through the stockade and open those dams and flush out the bottom end of the stream daily. It could have worked, but both lumber and tools were hard to acquire and other projects vied for attention. In May, 708 prisoners died. According to the Confederate adjutant general there were 12,000 prisoners on the 16-1/2 acres, with at least 500 arriving each day. The stream, "Stockade Branch," was fast becoming a quagmire. Prisoner Charles Chesterman, Co. A, 13th US Infantry, was to write, "All of the filth from the prison ran into the creek and we had to strain the water through our teeth to keep the maggots out." There were 1,200 guards, four pieces of artillery and a cavalry company, so the chance of escape was extremely small. Even the guards spoke about the excessive heat for May. In this heat the prisoners suffered from many types of diseases. Dr. Josiah H. White did everything in his power to alleviate the condition of the suffering patients. On the 21st the tunnel was opened and two fellows escaped to the outside. Myself next went outjumped up and ran for dear life. In an hour we had traveled perhaps three miles. We heard dogs after us. Capt. Wirz interviewed us. We were put in the chain gangnot so bad at all. We had more to eat than when inside. Am not permenently hurt any. It was in the beginning of May that Dr. R.R. Stevenson superseded Dr. White as medical director. In a letter to Major Thomas P. Turner in Richmond he said, "I wish to add a word in relation to the officer commanding the interior of the prison, Captain Wirz, who, in my opinion, deserves great credit for the good sense and energy he has displayed in the management of the prison at Andersonville. He is the only man who seems to fully comprehend his important duties." He went on to say that two commissioned officers should be assigned to assist him. 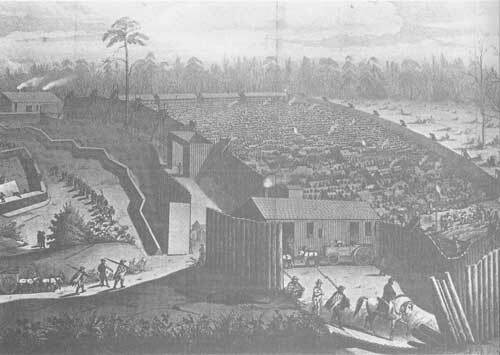 Captain Wirz reported on May 8 that he had received axes and spades from Columbus, Georgia, and would have everything in the interior of the prison completed in two weeks. In the same letter he said, "I am here in a very unpleasant position growing out of the rank that I now hold and suggest the propriety of being promoted. Having full control of the prison consequently of the daily prison guard, the orders which I have to give are very often not obeyed with the promptness the occasion requires, and I am of opinion that it emanates from the reluctance of obeying an officer who holds the same rank as they do." Now authorities were advised to move the hospital from the inside of the prison to the outside and furnish enough tents for 1,000 patients. There was insufficient room for the prisoners, much less for the hospital patients. Also, plans were being made to enlarge the stockade in the very near future. Men are continuously going up to the dead line and getting shot. They do not get much sympathy as they should know better. On May 7 the Macon Telegraph newspaper reported, "Mr. Fidderman informed me that the prisoners unanimously express themselves much better pleased with Andersonville than any place they have been since they were captured. They are now living bountiful on the very best that Southwestern Georgia can afford. Their daily ration consist of 1/3 of a pound of good ham or bacon and 1-1/2 pounds of meal. They also get peas and sometimes fresh and pickled beef. The patients in the hospital, in addition to ham and meal, get rice flour, potatoes, chickens and eggs." On May 8 John Ransom wrote in his diary, "We get a quarter of a loaf of bread, weighing about six ounces, and four or five ounces of pork." After rations were issued each day, there would be a general meeting of densely packed prisoners, all trying to trade for something more palatable, or for that which they had not gotten. Some would cry out, "Who will trade salt for wood? Who will trade wood for beans?" At this time Howell Cobb reported, "The duties of the inside command are admirably performed by Captain Wirz, whose place it would be difficult to fill. I still think the rank of the commanding officer of the post should be a Brigadier-General." 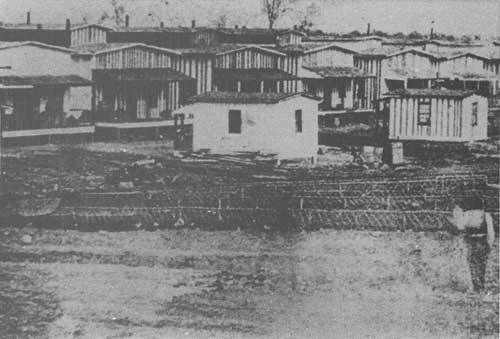 Camp Chase, located in Columbus, Ohio, was a training camp for newly inducted recruits, but it also became a prison camp for Confederate prisoners. 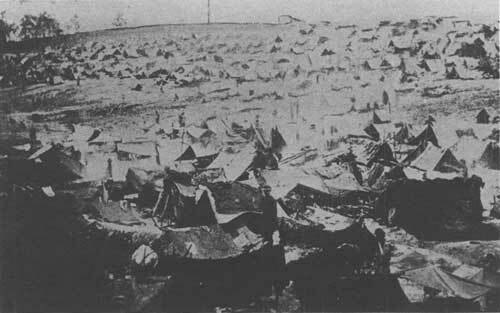 The first prisoners arrived in July 1861 and the camp closed after the war. During its existence it held 9,416 prisoners and had 650 guards. Water was obtained from wells 15-20 feet deep. The sinks consisted of a ditch which ran across the prison. Wood for cooking was delivered within the camp at three sticks per man per day. Rations consisted of bacon, beef, coffee, sugar and one loaf of bread each per day. 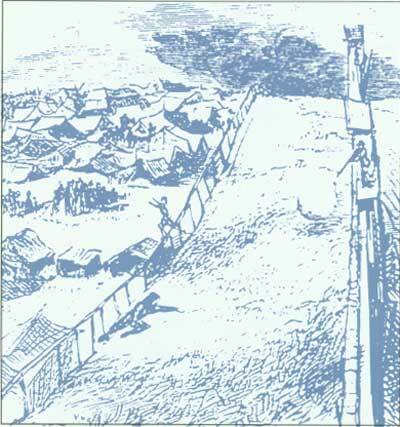 The wooden stockade700 feet long and 300 feet widewas smaller than the one at Andersonville. The prisoners were housed in barracks. During the time the prison was open 2,200 men died. They were buried in the prison cemetery which today is cared for by the United Daughters of the Confederacy. Sunday comes again. But, oh what a place to spend the Sabbath. No chiming bells. Nothing to put us in the mind of this being the Lords day, OH! How I long to be at home once more (and) go to church every Sunday. Many occupations were taken up by the prisoners, not only to kill time but to make money for their needs. There were bakers, bucketmakers and kettlemakers. Most of the raw materials were smuggled in since the guards had a fondness for Yankee greenbacks. John Ransom's diary entry on May 22 reveals that he had taken up laundering with a Minnesota Indian named Batiste. According to a report dated May 10 from the adjutant general's office, Captain Wirz was trying to implement his idea of draining the swamp area to make it more habitable for the prisoners. There would be an upper dam for drinking and a lower one for bathing. One million feet of lumber had been ordered; but there was no way to transport the lumber to the prison. Two squads of prisoners of twenty-five each were detailed every day, supplied with shovels and charged with the duty of removing from the encampment all offal, the combustible part of which was burned and the rest thrown into the stream. In the early summer, Captain Wirz issued to the prisoners picks and shovels, with which to dig wells for increased water supply. From some of these wells the men started tunnels through which to escape. Discovering this, the commander withdrew the tools, and ordered the wells to be filled up. Prisoners had been allowed outside of the prison to collect wood and pine boughs for their shebangs, but the intimacy between the guards and prisoners became so great, the practice had to be discontinued. The prisoners were allowed to receive boxes of food from outside after a careful inspection of the contents. They also were allowed to receive and send mail subject to the post commander's approval. A letter box was installed inside the stockade. If a box was received for a prisoner who had died, the box was given to hospital authorities for distribution. By mid-May the guards numbered 1,193. Artillery consisted of four guns: two 10-pounders, rifled, and two Napoleons. Both sets of guns were on hills commanding the two prison gates and the interior of the prison. The number of men detailed for guard duty each day was commissioned officers, 7; noncommissioned officers, 16; privates, 280; total 303, exclusive of artillery. The guard was posted as follows: one man in each sentry box on the top of the stockade, forty men at each gate in the day and eighty at night. The remainder were posted around the stockade, fifty yards from the wall. 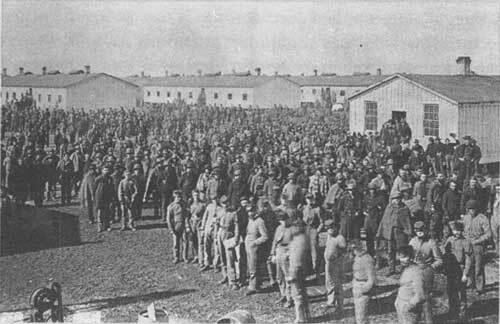 Camp Douglas, located in Chicago, Illinois, became a prisoner-of-war camp in February 1862 when General U.S. Grant captured Fort Donelson and sent between 8,000 and 9,000 captured Confederates to the prison. Over the course of its existence the prison housed upwards of 30,000. The prisoners stayed in barracks. The prison had an inadequate sanitary system, sometimes poor food, not enough clothing or blankets, inept and inaccurate record keeping, confused leadership and oftentimes cruel discipline. Death came from diseases such as typhus, dysentery and small-pox, but mostly from the cold. A total of 3,759 prisoners died at Camp Douglas. They were buried at Oak Woods Cemetery. Located within the cemetery is the Confederate Mound Monument, which notes that this is the largest burial site for Southern soldiers in the North. The hospital was divided into two divisions, with a full surgeon in charge of each. One of these divisions was subdivided into three wards and the other into two. Each ward was under the care of an assistant surgeon. Numerous prisoners were detailed as nurses and hospital stewards for all purposes. A surgeon was appointed each day as professional officer of the day whose duty it was to see that the hospital was well policed and that the nurses and stewards discharged their duties promptly and efficiently. This officer was required to make a daily morning report. The diseases most prevalent among the prisoners were dysentery and diarrhea. About one mile from the prison was the smallpox hospital. On the 20th of May, the hospital was moved from inside the prison to outside the stockade. It was located in a stand of timber on two acres of land to the southeast of the main enclosure. It was enclosed by a board fence about six feet in height and was laid out in regular streets, or wards. The hospital was supplied with water from a creek that ran through the southwest corner and was unadulterated with the filth and garbage of either the rebel camps or the prison pen.